PLANT OF THE MONTH- APRIL 2019 - Basics Landscpaing Co., Inc.
Characteristics: Daffodils come in a variety of colors, shapes and sizes. 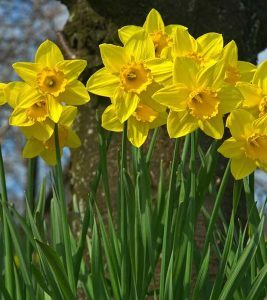 Moisture: Daffodils prefer well-drained soil, though they will grow almost anywhere. Plant: Daffodils look best when they are planted in informal groups rather than in straight rows. Clusters of bulbs in a triangular, oval or rectangular shape will have a fuller, more natural look.